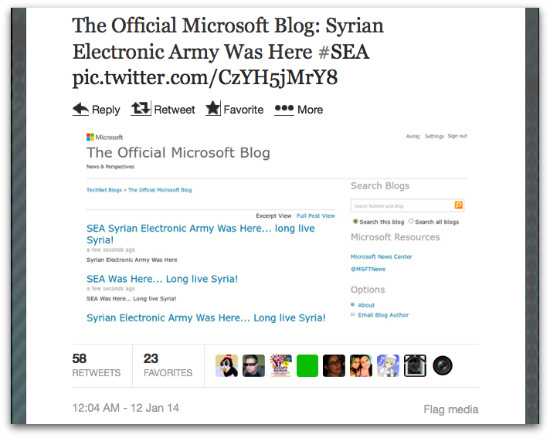 The Infamous Syrian Electronic Army has hijacked numerous Microsoft Twitter accounts, The Official Microsoft Blog at blogs.technet.com as well as an Xbox support account. A member of the SEA going by the name “Syrian Eagle” told Mashable in an email that this is just the beginning. The assailants additionally Tweeted a screenshot of what seems to be The Official Microsoft Blog at blogs.technet.com compromised. Microsoft did not release a statement concerning the assumed attack, but Mashable states its journalists watched it in action and verified that it lasted approximately one hour. All sites and accounts have been recovered.